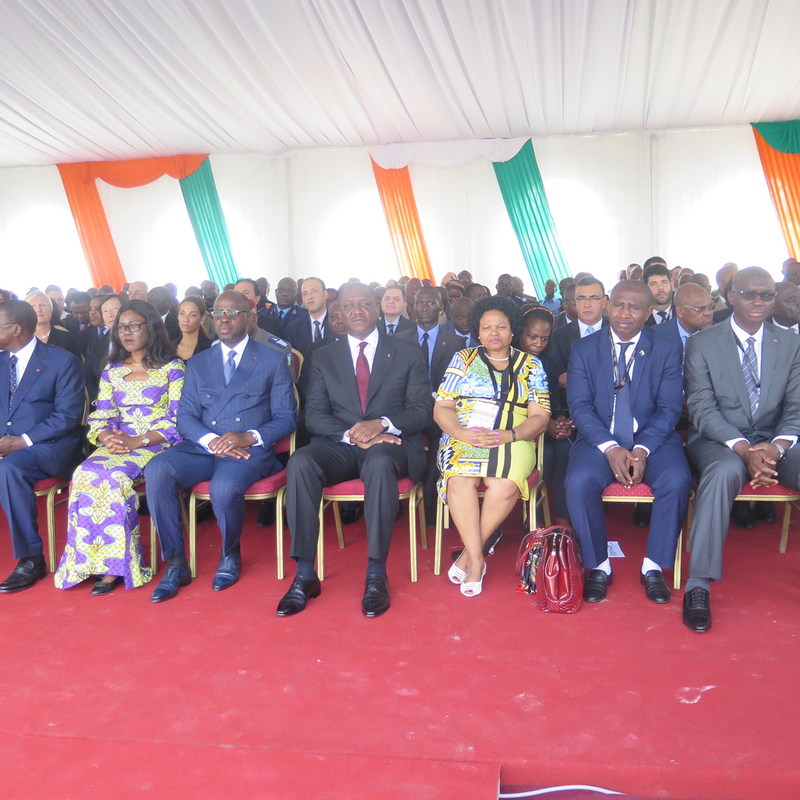 Opening ceremony where Minister of State Hamed Bakayoko, Minister of Defense Alain-Richard DONWHI and several African personalities. Wanted and conceived by Africans to address the security challenges of the continent, ShieldAfrica has aroused great interest since its first venue in Abidjan in 2013, a marked interest from both institutional and private operators. Demonstration of interpreting the special forces of the Ivory Coast against terrorists who wanted to carry out an attack. 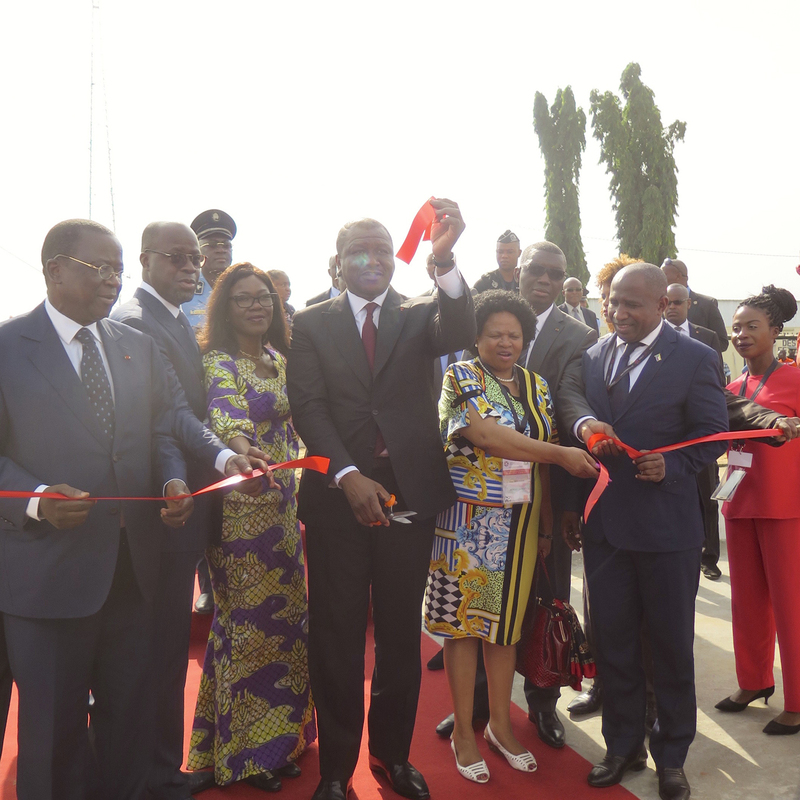 For its fourth edition, ShieldAfrica organised under the high patronage of the Department of State, Department of the Interior and Security in Abidjan from 24 to 26 January 2017, opened its doors at the National Police Academy and was inaugurated by the Minister of State, Minister of the Interior and Security, Hamed Bakayoko. Fair security and show welcoming an international audience, he suggested to delegations from many countries in Africa of technology solutions to develop or improve the security on the African continent. ShieldAfrica met this year 130 exhibitors from 24 countries including 93% international, more than 45 delegations coming from 25 countries in Africa, with among them 25 representing the area of security — including 4 Ministers of the Interior and 16 representatives in the field of defence including 1 Minister of defence, 200 VIP and 850 professionals representing 61 countries, including 28 States ; all these figures according to the organisers. 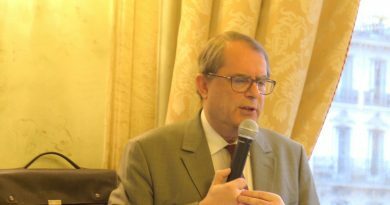 The French Ambassador to Côte d’Ivoire has just attended the conference with retired General Petrick Colas Des Francs. Speakers and VIPs who participated in the Shield Africa conference at the Sofitel-Ivoire hotel on January 23, 2017. 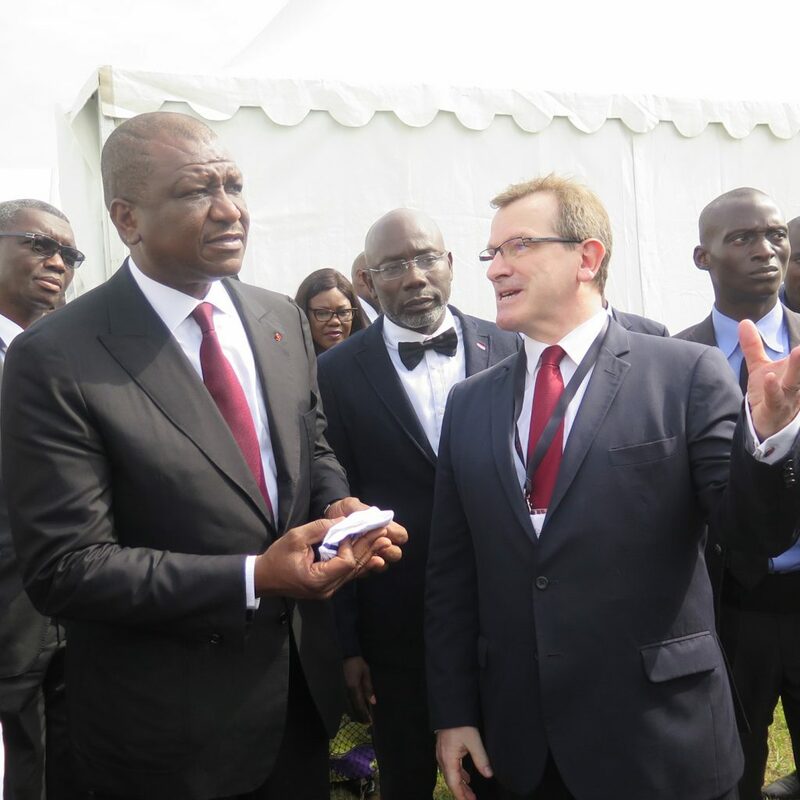 On the eve of the exhibition, took place at the plush Hôtel Ivoire in Cocody the ShieldAfrica conference. Its theme “Africa, protect our development: towards an integrated approach”. It brought together many African delegations invited by the government of Ivory Coast, industry exhibitors as well as many international personalities. 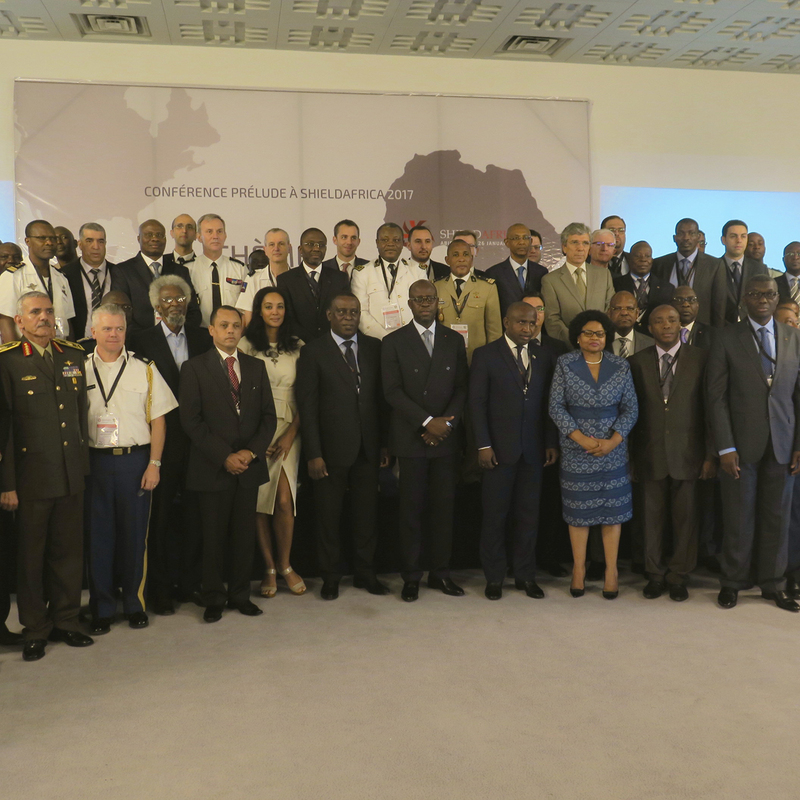 Despite the fair speech made by the Ivory Coast’s Minister of Defence, Alain Richard Donwahi, and the successful presentations given by Dr. Niagalé Bagayoko, Dr. Sheikh Tidiane Gadio, Général de Brigade Thierry Cailloz and Ziad Khoury, the quality of the conference was average. 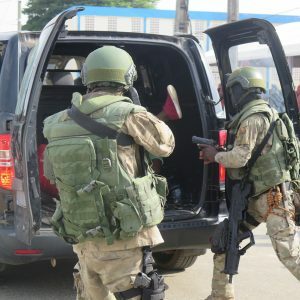 Especially in the area of security where the present African countries tended to focus on private security rather than on State security, a point that will certainly induce a certain number of problems at government level — as is the case today in South Africa. 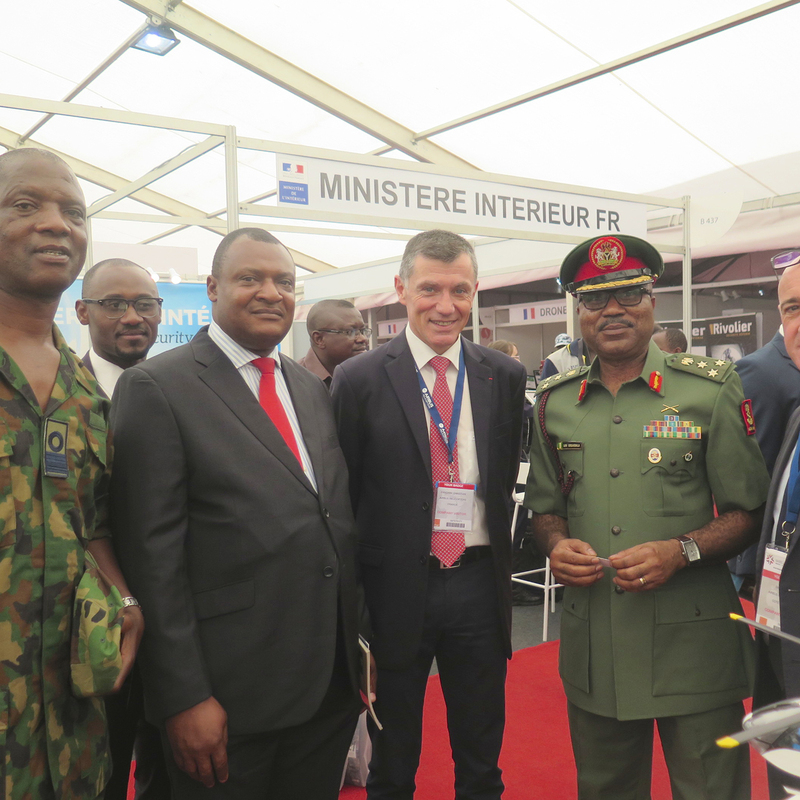 The inauguration of the exhibition by the Minister of State Hamed Bakayoko and the Minister of Defense Alain-Richard Donwahi. The show was well organised and provided good services, providing a hint that Shield Africa should become soon one of the continent’s main thematic events. Africa is witnessing today major evolutions due to expand over the coming years. Particularly a most important and growing urbanisation which increased from 42% in 2000 to about 48% in 2015, and now estimated to reach 61.7% in 2050 — a high population boom which will reach around 2.8 billion in 2060. In addition, several military programming law signed up to 2020, should drag several industrialists to make a move into the region. Well represented and most noticed activities at the show were vehicles for the armed forces and security forces, communication systems, shelters and modular infrastructures, personal protection, surveillance and protection equipment, guns of smaller calibers as well as speedboats and small seacraft. Stand DCI at ShieldAfrica 2017. 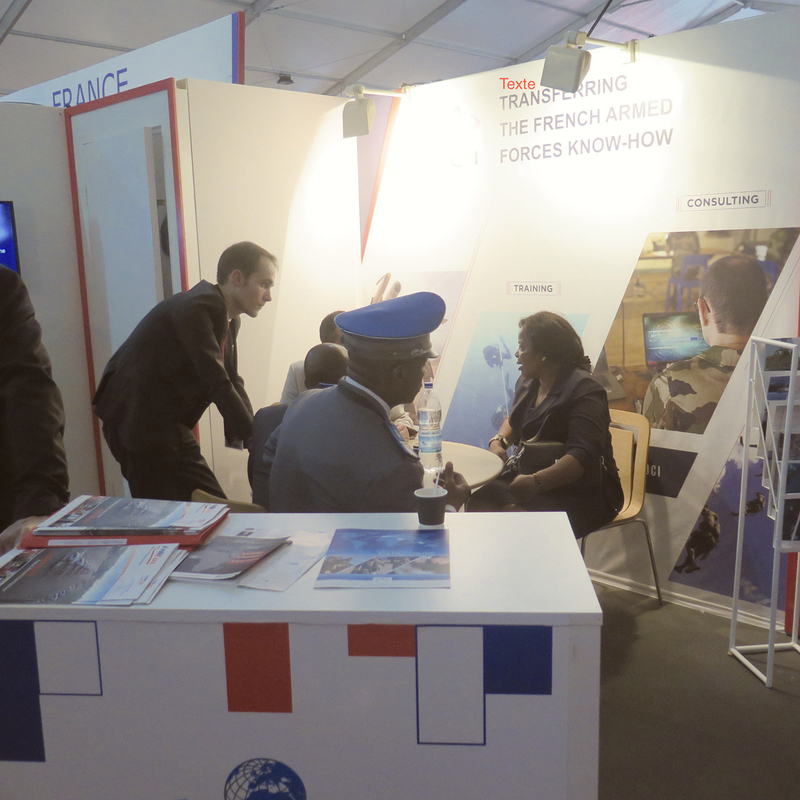 Among the companies exhibiting at Shield Africa we noticed the leading presence of Thales, exhibiting on its stand several tactical radios, various models for urban safety solutions and maritime surveillance radars, and that of DCI the number one French provider of gov-to-gov training services, from helicopter schooling to medical formation. gabions in panels of welded mesh lined by a geotextille. 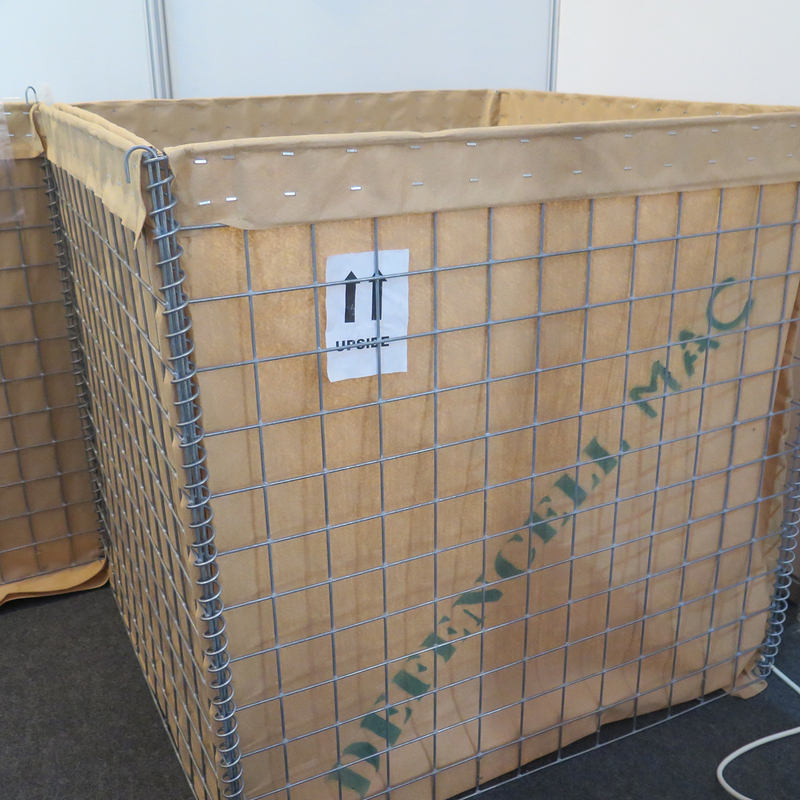 Small businesses from France included Defencell Mac, which produces a new line of gabions in panels of welded mesh lined by a geotextille. It is a multicellular element made from linked by spiral welded mesh panels, and doubled by an envelope of geotextiles retention. 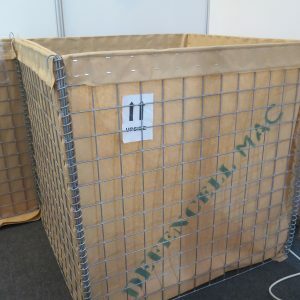 They are filled with Earth, sand or other filling materials available on the site providing ballistic protection, explosion-proof coverage and a barrier against hostile vehicles. Manitou group, a world leader in all-terrains material handling, was also exhibiting. The group designs, produces, distributes and services equipement intended for construction, agriculture and industries. Product ranges include fixed, rotating and heavyweight all-terrain telescopic forklift-trucks, compact backhoe loaders on wheels or tracks, aerial work-platforms for personnel, truck mounted forklifts, warehousing equipement and attachements. 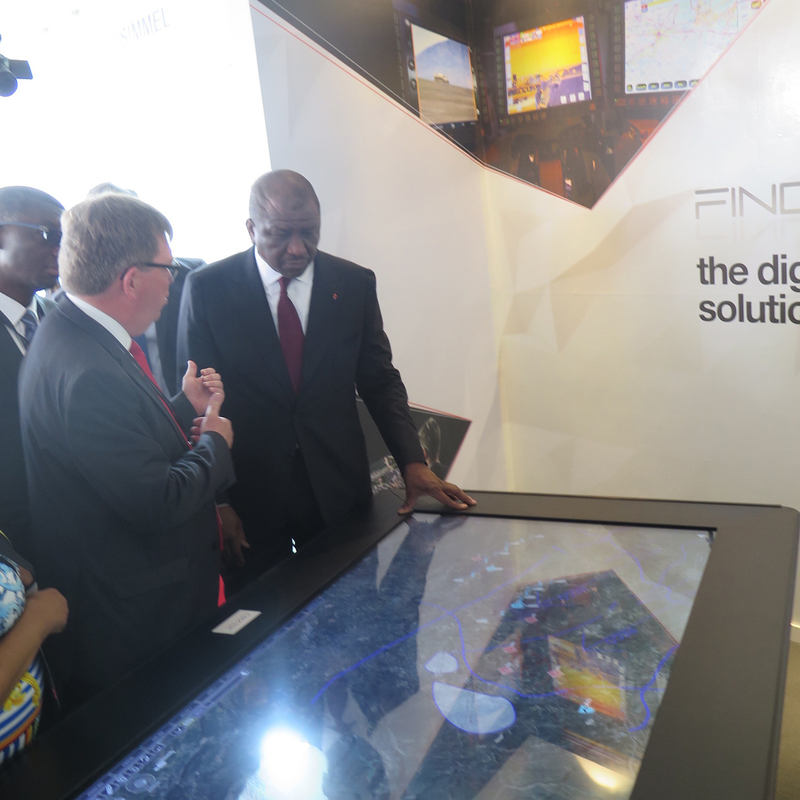 An African delegation visits the Airbus booth with the regional sales manager. The Airbus group was represented at Shield Africa by Airbus Military & Space and by Airbus helicopters exhibiting their H125 Squirrel best-seller and the twin-engine H135 and H145 models. 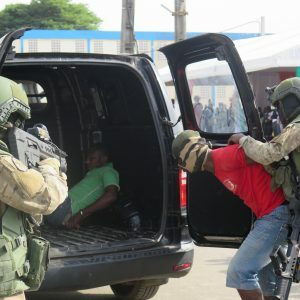 In Côte d’Ivoire, Airbus has already sold a single Dauphin VIP for the Ministry of the Interior and the group is searching for other contracts; in order to respond to the new and various African military planning laws which call for the acquisition of about 180 helicopters civilian and military. Stand Safran with range of binoculars of visions nocturnes. Safran Electronics & Defense introduced equipment in the field of night vision and the PLRF25C Pocket laser rangefinder; and in the field of target observation and acquisition by day and night with the twin Moskito II ‘light weight’ and multimode target locator. But also the binocular Vector Rangefinder, as well as the Vigy-Observer — a main optronic system for interceptors or speedboats. Present as well the EuroFlir ball TM 350 for the surveillance and reconnaissance mounted on a helicopter and also the Vigy-Observer which allows military crews to carry out surveillance and identification missions day and night, whatever the weather conditions. Minister Hamed Bakayoko on the booth Nexter listens to the representative of the region on the importance of the FINDMP system. 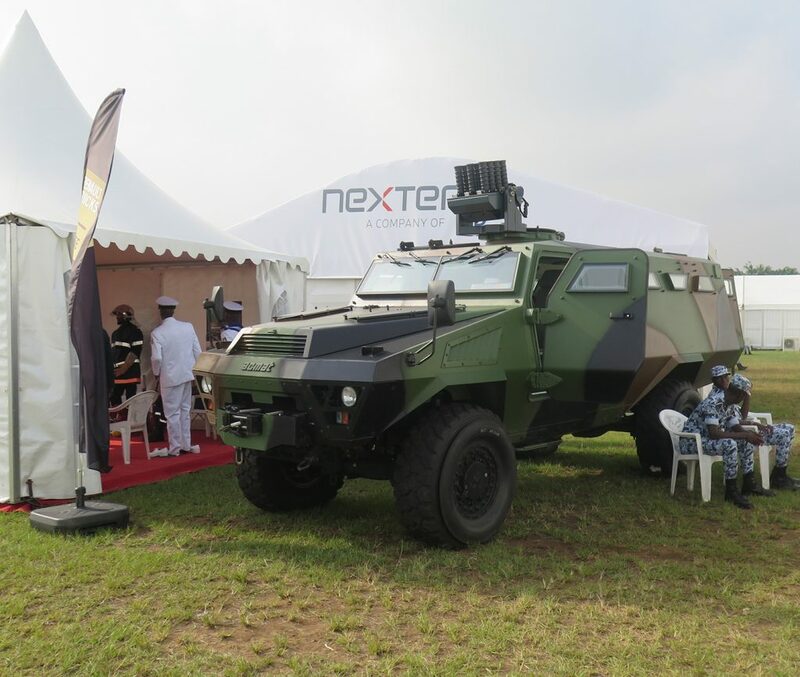 Nexter group exhibited in model form its range of artillery — Caesar, 105 LG 1 and P20 for light vehicles — the NC621 gun pod for light helicopters, the Narwhal or still the 15 / 15B, as well as its range of ammunition, and various models of its Aravis 4 x 4 armoured vehicle (already sold in Gabon) and a copy of the last generation Titus 6 x 6. 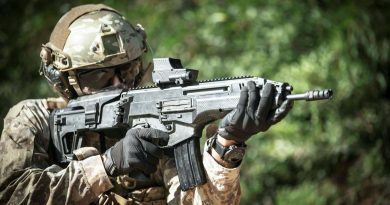 Unveiled at DSEI 2013, in London, the Titus exhibits an unrivaled level of modularity based on combat missions kits, operational environment kits in a wide family of variants. The highly protected Titus is able to fulfill a full range of required missions from infantry transport to combat missions, combat support and combat service support, a joint endeavour of Nexter and Tatra is due to further strengthen the cooperation of France and the Czech Republic. Under the terms of their agreement, signed at the last IDEX exhibition in Abu Dhabi, the two companies will offer the Titus in response to a Czech and Slovak armed forces’ demand, with Nexter acting as design authority. The Euro-Shelter which is a versatile hospital mobile. The French company also displayed in the area of Robotics its Nerva system and especially the Euro-Shelter which is a versatile hospital mobile, stations, mobiles and ambulances clinical aid post are interim care facilities going to the more close to demand whenever the hospital facilities are absent or indispensable, as is the case in West Africa, where Gabon was the first purchaser followed now by several other countries in the region. 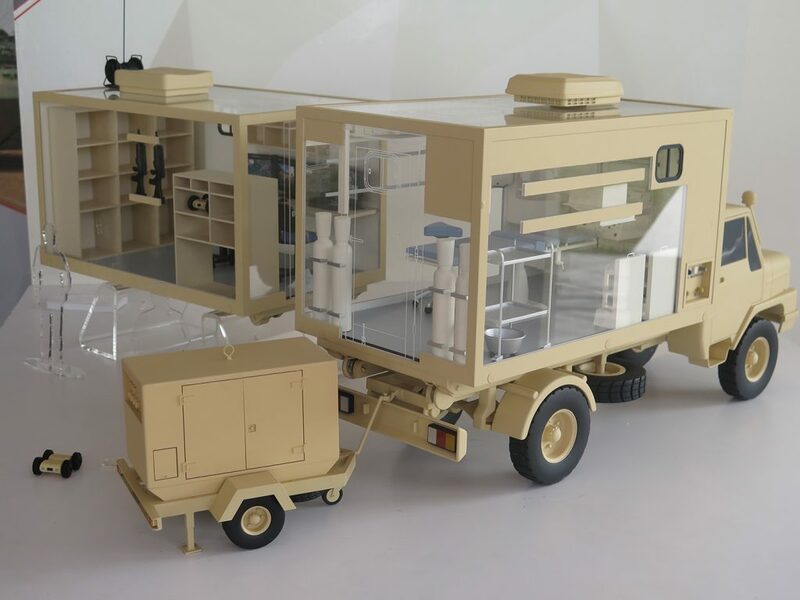 The advantage of Shelter has various modules which can be turned into a monitoring center for captive drone, a mounted police C2 ; it has its own electric power supply or be connected to the general network. Nexter also exposed its new mission FINDMP system, which is a complete system for the preparation of mission. It is used for the initial tactical thinking, either to support the different stages of the decision-making process, or for the theoretical study of military modes of action. It is a digital solution providing modularity and an immediate reversal, this within a time compatible with the rhythm of the maneuver. FINDMP in the same time facilitates the coordination between joint units which has become more complex and systematised nowadays by integrating indirect support (airplane, helicopter, drone, artillery and mortar). It will also report the field with this system plays via the 2D/3D visualisations. 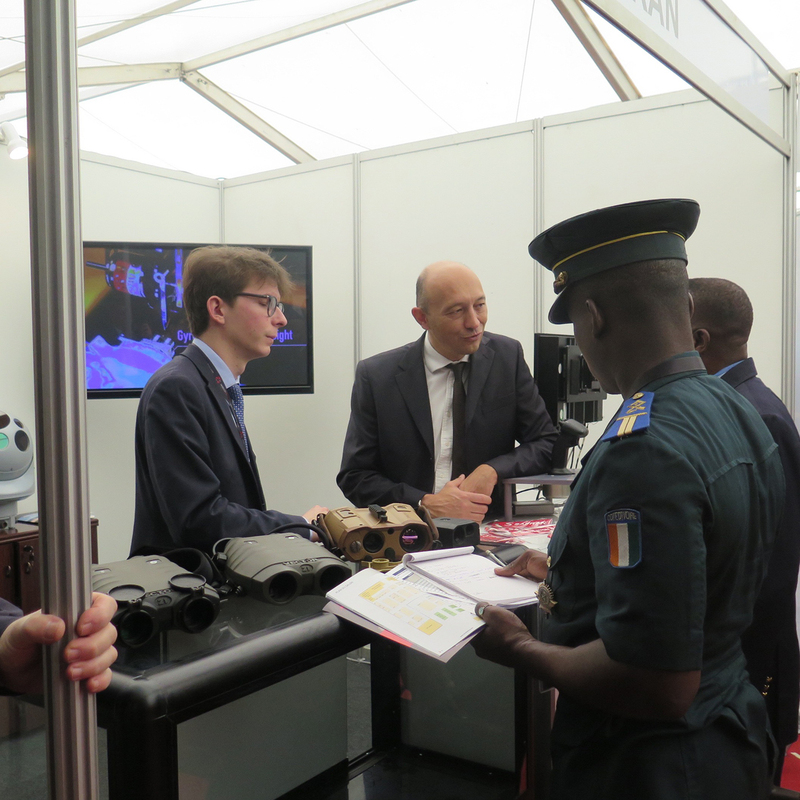 The Minister of State of the Ivory Coast listened to the explanation of the president of Renault Trucks in front of their stand. VLRA under the colours of the FANCI. The Bastion is a 14.5 ton armoured vehicle, it has high mobility and power engine. 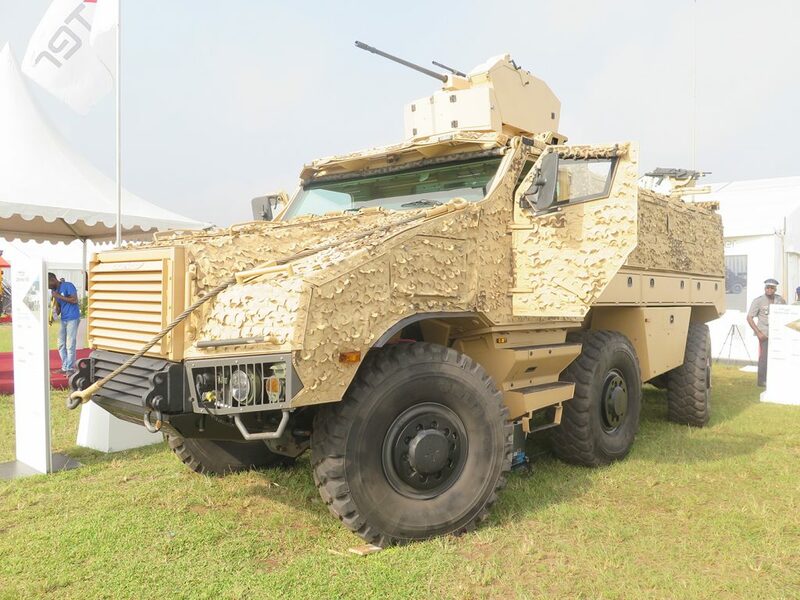 Renault Trucks Defense has been well known for years in Africa, especially through the sales of 1,000 vehicles (VLRA 1 and 2 light vehicle recognition and support) and 1,000 ALTV (tactical light vehicle) in the region, both produced by its subsidiary Acmat. 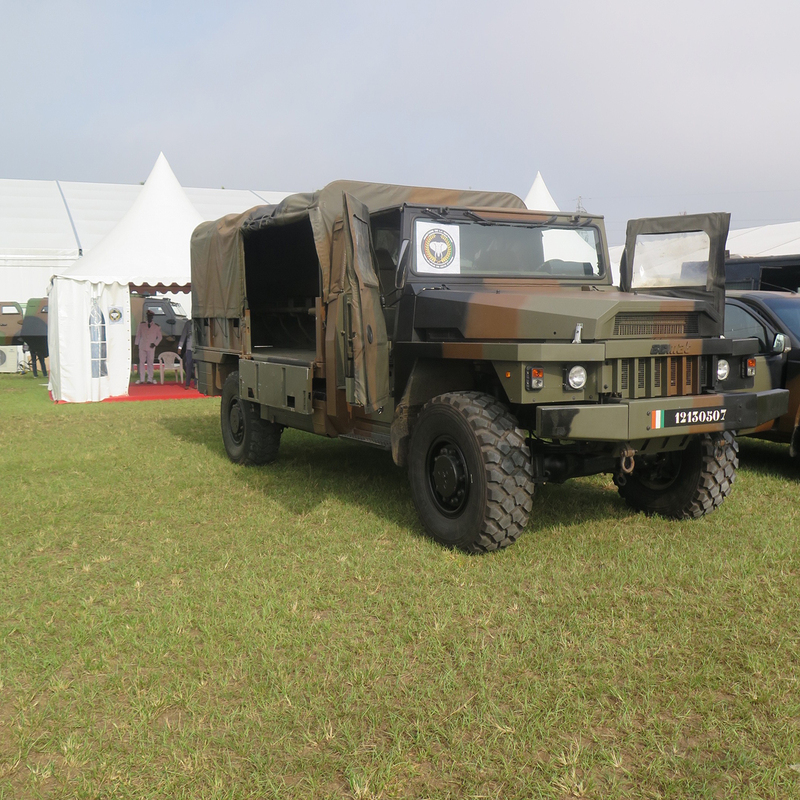 At Shield Africa, Renault introduced the VLRA and ALTV under the colours of the FANCI as well as its new Bastion. The Bastion in HM version is an improved version. 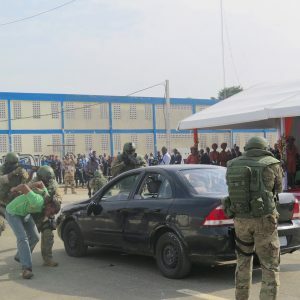 It has been sold to United African forces for the law enforcement in Central Africa and one was event provided to TACOM, the U.S. command in the region. The Bastion is a 14.5 ton armoured vehicle, it has high mobility thanks to a powerful 340hp engine coupled to an automatic transmission. An independent suspension gives the Bastion combat vehicle an excellent power/weight ratio and exceptional off-road capability, and a significant payload. 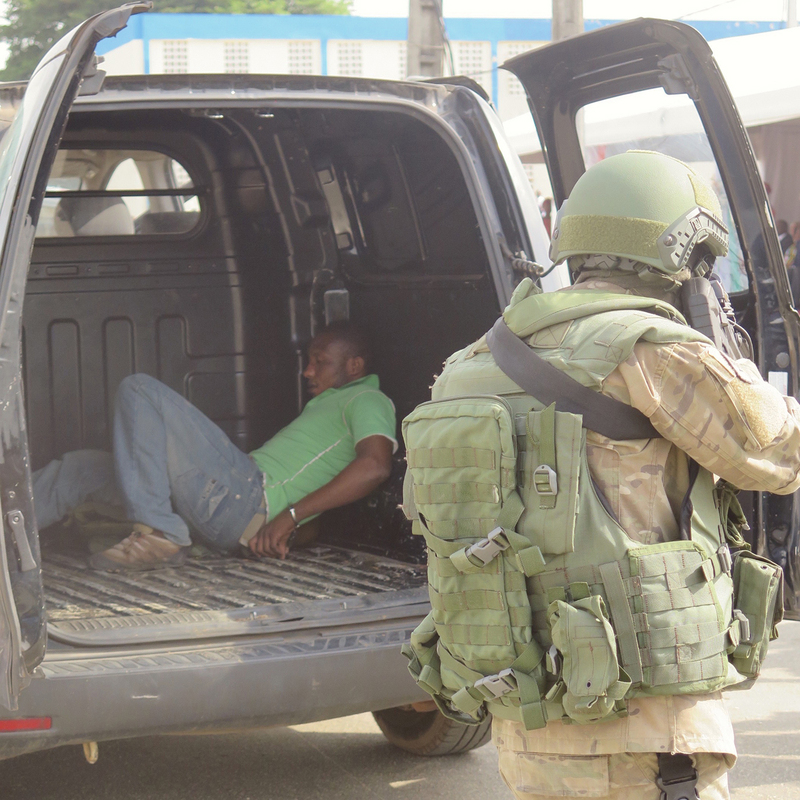 The monocoque armoured truck offers a wide internal volume as well as excellent protection against ballistic attacks, mines and IEDs according to STANAG standard. For the first time at Shield Africa 2017, Rosoboronexport presented foreign customers with a total of about 250 pieces of Russian-made military hardware. 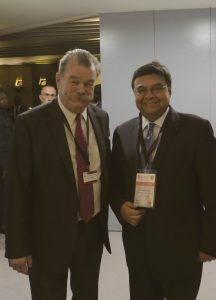 The company aroused heightened interest among foreign delegation representatives, notably with the Mil Mi-35M multi-purpose attack/transport helicopter, the Kamov Ka-226T light multipurpose day/night helicopter, the BTR-80A APC, the VPK-233136 special armoured wheeled vehicle, as well as the Project 12150 Mangust fast patrol boat and the Project 14310 Mirazh patrol boat exhibited on its stand. 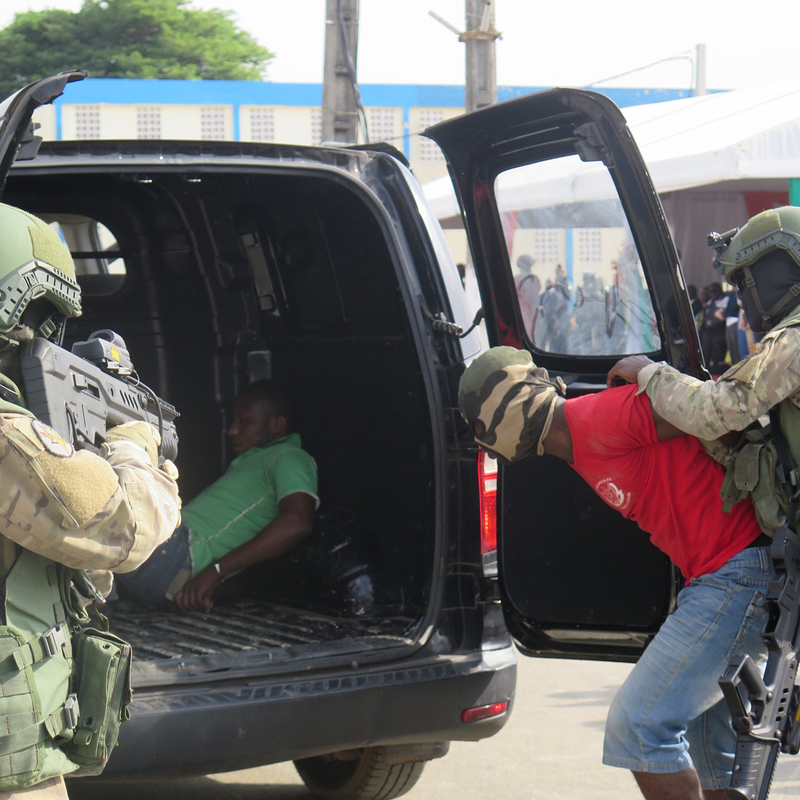 In Abidjan, Rosoboronexport also unveiled a new ambitious marketing project titled Counter-terrorism and Law Enforcement, designed to identify the sources of terrorist threats and illegal activities, conduct anti-terrorist operations, provide law enforcement and the protection of critical facilities and the coastal zone.